The DF8A-1 is an in-ceiling smoked dome enclosure from Pelco that is designed to be used for fixed cameras. A clear type dome appearance, 360° horizontal positioning, as well as indoor/outdoor versatility, and a back-box with an aluminium construction and cable openings for cable entry. The DF8A in-ceiling dome also features a 30° tilt, an acrylic bubble, a lower dome that is 21.59cm’s in diameter, a quick camera access point, plus can be used in hard ceilings or 2’ x 2’ suspended ceilings. 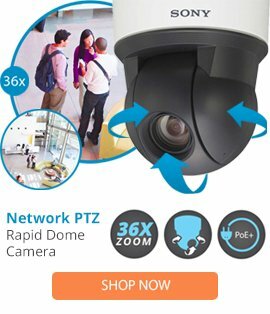 This dome is able to accommodate a camera and lens up to 22.86cm’s, and comes user friendly for optimal camera protection.